It's almost 2012 - is the end near? It sure feels like a lot of the world is ending as we've known it, but thoughts about the end of time have been around with us since time practically began. So let's spend the year delving into what the apocalypse and post apocalypse might look and feel like from writers of the last couple of centuries. Our theme for 2012 is apocalyptic books! As always, the titles are all 15% off for Reading Club members and all you have to do to join is tell us at the counter! Discussions for each title is the last Wednesday of the month, at Atomic Books, 7:30pm! Join our Facebook Group for further discussions and updates. Cookie Swap 2011, originally uploaded by sugarfreak. Kids books that make you cry are the best. Perfect, incredibly reasonably priced blank books for your writing or art. Great for kids and adults alike. I'm a knitter, you're a knitter, wouldn't like a knitting corn mug, too? Henry & Glenn Forever Sticker Funbag! Their eternal love, now in sticker format. 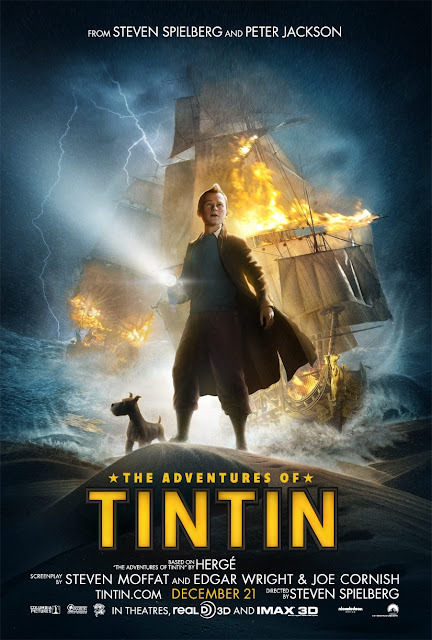 We have free passes to see a sneak preview of The Adventures of Tintin for this Saturday, Dec 17th, 10:30am at the White Marsh AMC. Just come on by and ask! And as always, we stock Tintin comics! This Friday, meet Scott C who'll be at Atomic giving a presentation about his work in illustration, comics, video games and signing his new book, Amazing Everything. 7-9pm! Next Thursday, December 15th, join the Yelp Hampden Holiday Hop Shopping Crawl! All the participating shops will be giving a part of their proceeds for the night to local charities. We'll be donating ours to Moveable Feast. From 5-9pm, refreshments and sales! Then, on December 16th, from 6pm-8pm, we're having a special Happy Hour event with Craft Beer Bar Mitzvah! Shmaltz Brewing proprietor, Jeremy Cowan, celebrates the national release of his debut small business memoir Craft Beer Bar Mitzvah with a book reading and beer tasting at Atomic. And remember, Santa is also walking around the Avenue every weekend until Xmas! I'll be on WYPR's (88.1FM) The Signal this evening at 7PM (and again Saturday at 1PM) to talk holiday books suggestions. You can only talk about so many books on the radio, so be sure to stop by the store - there have been so many really great books to come out this season. And now we come to the last book of the year for our Reading Club, Yoshihiro Tatsumi's Good-bye. Your eyes aren't playing tricks on you, yes, it had originally been The Push Man but that title has suddenly gone between printings (it'll be back in softcover in the Spring). As usual, it's 15% off for Club members and we meet the last Wednesday of December to discuss! Join our Atomic Reading Club on Facebook for updates, extra discussions and shenanigans.